The Wayward Princess is an extended and cohesive story based on the four short stories that comprised the out-of-print Magic at Wychwood. A Gypsy lad named Finch arrives at Wychwood Castle to find it a tangle of muddled chivalry and magic. 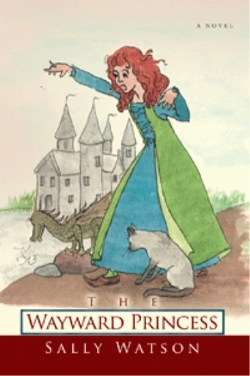 Though four royal children conform to rules of chivalry, Princess Elaine is a red-haired hoyden who can’t faint, wants to study witchcraft rather than marrying, and whose magic spells always go wrong (and so do most others). Prince Arthur wishes that just once, people would follow the rules of chivalry-but they never do-not even Thunder, his warhorse, who loves to cheat at tournaments. Finch, fascinated, stays as stable boy and tone-deaf troubadour to join Elaine in scrapes. What with the awful Fer de Lance family, a wicked enchantress, a mad magician, two witches, three cats, a sourcerous hive of bees, a spell-casting mouse, and some temperamental horses, they manage to enchant broomsticks, palace guards, a feather duster, a footstool, troubadours and even Elaine herself. King Godobert, determined to find husbands for his daughters, holds a Quest. No one wants Elaine, so, betrothed willy nilly to a perfect stranger, she rages that she won’t marry him. Finch vanishes. Elaine misses him-but when a pink magpie delivers a “save me, save me, save me” message, life promises to be interesting despite everything.